You have come upon a blog discussing tools to help dyslexics and hyperlexics. The topic, this time, is emotion. When I was first diagnosed as dyslexic (age 45) I was told there were no solutions to help me. The reason: I could sound out works, read words and had a good vocabulary — the usual definition of a dyslexic. Yet, the test pigeonholed me as a dyslexic. 1. Give up eating foods with refined sugar. The reason: stop the inner rushing in my body. I followed the advice and a year later the rushing stopped almost entirely. This correction made me ready to move to the second piece of advice. 2. Work with a therapist to discover within myself emotional issues that were unresolved. At first I wondered, is this really necessary? But going off refined sugar had improved my ability to be quiet within and more willing to pick up a book. So, perhaps clearing pesky emotions was worth exploring. when reading a book with characters who had emotional issues that resonated with me, I would not continue reading the book. When I discovered this behavior I taught myself to stop reading. I defined where the emotion being expressed in the book was existent in my life and then processed it. By processing, I mean delving into the issue, seeing where I was the victim or the perpetrator and then discovering how to forgive myself and others. The change doesn’t happen quickly but eventually positive results emerge. When done, I went back to the book and continued reading until another emotion stopped me. It took me about a year using this discipline to move out of this “stopping reading behavior” caused by buried emotions that needed attention. What I now understand is that my feelings were hidden, or not accepted as real by me or others. They were churning about within, an explosive energy. No longer were they simply a feeling. My technique as a child and adult was to bury my dark feelings. Feelings left unexpressed build up. They took up space inside me. They tried to get my attention by “preventing” me from being able and/or willing to read. I didn’t realize they wanted attention. I can see now that my emotions are my reactions to my feelings I was choosing to avoid. Years later I was re-diagnosed as hyperlexic: meaning I could read words fine, but comprehension was the problem. If I hadn’t done the emotional homework I know that my work of correcting the hyperlexia would have been much more difficult, if not impossible. Books: dyslexia, hyperlexia, child development etc. This blog provides a list of books that specialists in dyslexia, hyperlexia child development and other relevent topics have recommended or have written. I am continually adding titles to this list as I find them on-line or when attending talks. So, do revisit this blog. While I have not read all those listed I do include a brief description of each book. Hope this information is helpful to you. Integration of Infant Dynamic and Postural Reflex Patterns: Svetlana Masgutova. This title may sound intimidating. However, it is worth spending time with this information. About four years ago I discovered the work of Svetlana and her associates. Through her we unearthed the fact that some of my reflexes (like crawling on my stomach) were not properly developed when I was in utero or during the first three years of my life. Svetlana Masgutova’s Neuro-Sensory-Motor and Reflex Integration Method for Children and Adults increased my ability to both read and comprehend. I strongly recommend that anyone with a dyslexic, hyperlexic, autistic, aspergers child research this approach. Changes occur. And, I recommend that this be one of the first steps to take with a dyslexic/hyperlexic. I can say that having my reflexes now functioning at full capacity changes much for me in my ability to read and comprehend. Brain Gym: Paul E. Dennison (a dyslexic) and Gail E. Dennison. This book outlines in easy to understand form activities for Whole Brain Learning. This approach was very helpful to me in mastering some of my dyslexic characteristics. Visualizing and Verbalizing: For Language Comprehension and Thinking: Nanci Bell. Ms. Bell is one of the founders of Lindamood Bell. This company has an excellent assessment process to determine dyslexia and hyperlexia as well as programs to improve dyslexic and hyperlexic conditions. I took the Visualizing and Verbalizing course – seven weeks, five days a week, four hours a day and moved my comprehension skills from Grade Three level to Grade Nine. This outfit is very professional. 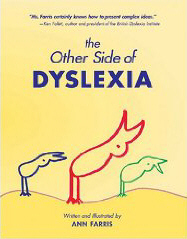 Overcoming Dyslexia: by Sally Shaywitz. This book has been out for sometime and is considered an important resource by most. Most of the findings are based on research. I have heard Dr. Shaywitz speak several times. She has followed several dyslexics from a young age to maturity. Her focus is very scientific. The Schwab Learning Website, http://www.schwabfoundation.org, lists six books that a parent, Darla Hatton, thinks is most useful for others suddenly faced with the challenges of dyslexia, be they a parent, teacher or dyslexic. Wrightslaw: from Emotions to Advocay: by Pam Wright and Pete Wright. I haven’t read the book but from experience with my dyslexia and hyperlexia, there is much credence in giving focus to emotional issues as part of the process of handling both conditions towards a positive result. One Word at a Time: by Linda G. Tessler. A dyslexic’s story: She’s a PHD and dyslexic. Dyslexia Wonders: by Jennifer Smith. It’s a child’s point of view. Instructions and Assessment for Struggling Writers: edited by Gary A. Troia. It describes several best practices for teaching writing. Dyslexia for Dummies: World of Dyslexia says: this books indicates how to spot the signs and get the proper treatment. This friendly guide shows parents how to identify the signs of dyslexia, choose among dyslexia treatment options, and find an individualized education program for their child. They’ll also find practical tips on assisting with homework, helping a child build self-esteem, and easing the transition to high school and college. How to Reach and Teach Children and Teens with Dyslexia: World of Dyslexia says this book is a comprehensive, practical resource giving educators at all levels essential information, techniques, and tools for understanding dyslexia and adapting teaching methods in all subject areas. Over 50 full-page activity sheets that can be photocopied for immediate use and interviews with students and adults who have had personal experience with dyslexia. Organized into twenty sections, information covers everything from ten principles of instruction to teaching reading, handwriting, spelling, writing, math, everyday skills, and even covers the adult with dyslexia. Primal Teen by Barbara Strauch At a recent PEN speaker’s panel this book was highly recommended by a Resource Specialist. Update as of 9.10. At a recent PEN Speaker Series discussion, the speaker Claudia Koocheck, Head of School at Charles Armstrong, in Belmont, CA recommended these two books for parents of children with learning challenges. Update: 11.10 I attend a talk by Katherine Ellison whose new book, Buzz, has just been published by Voice, Hyperion, New York. The topic: Attention Deficit Disorder. I highly recommend it. There are excellent explanations of the challenges and useful solutions she discovered with her son who is ADD. Ms. Ellison is also ADD. Dr. Daniel Korb, a developmental and behavioral pediatrics specialist recomends books by Carol Gray. These social story books describe a situation, skill, or concept in terms of relevant social cues, perspectives, and common responses in a specifically defined style and format. http://www.thegraycenter.org. Finally, I am continuing to evolve this site, including incorporating dyslexic and/or hyperlexic information that others have to share. Yes, I am looking for your ideas. Send them via the Comments below. You have come upon a blog discussing tools to help dyslexics and hyperlexics. Today I read about a recent book, Dyslexia in the Digital Age, which focuses on ways that technology can be helpful to dyslexics, both children and adults. Speaking for myself, using a computer/internet etc has been very supportive in giving me freedom to learn new ideas quicker — mostly because I seem to be able to image words faster working on the computer or reading the information on-line. And, when I can’t image, Google is there. I put in the word that is stumping me and I get a definition. This enables me to get an image (usually) and then the word makes sense. It’s available in hardback only. Paperback will be out in May, 2010. I went on Amazon and they are selling the book in the US for $26.32. Have any of you read this book yet? Please comment if you have. Finally, I will continue to evolve this site, including incorporating dyslexic and/or hyperlexic information that others have to share. Yes, I am looking for your ideas. Send them via the Comments below. Information on this blog is intended to complement, not replace, the advice of your own physician or health care professional?